When I'm looking for a quick meal to get on the table, there's a 50% chance that I'm reaching for some sort of noodle*. Combine the noodles with some sort of protein and a veggie or two, and there's a quick meal on the table. Now, normally those are every day meals...the kind that may get a shot on Instagram, but probably don't make it to the blog. Until there's one that is so ridiculously good, that it needs to be shared. Like this one. The day before, I was lured in by the scent of little chickens spinning in a rotisserie. I don't know about you, but I find that smell intoxicating. Normally we'll make quick work of two of rotisserie chickens, but for one reason or another, we had a whole chicken left the next day. The first thing I thought of was my favorite Peanut-Sesame Dressing. I love it tossed with cold chicken and crunchy veggies. So I made it...and I did a little munching. And then I decided that I wanted to turn it into a meal. 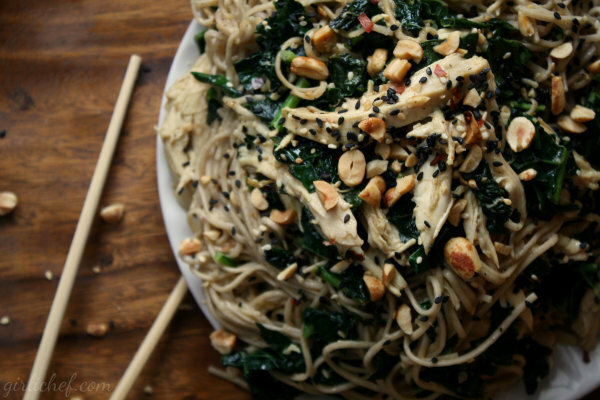 I had some soba noodles hanging out in the pantry and some beautiful kale that I'd picked up at the market at the same time I was smitten by those little chickens. A quick peak revealed half a jar of honey-roasted peanuts, a couple of small containers of sesame seeds, and our ever-present red chile flakes. To me, it sounded like dinner. The dressing that I love so much cold or at room temperature transformed into a warm sauce with ease. I had a bit of the whole shebang left-over, and it was just as great at room temperature as it was hot. *...the other 50% of the time, I'm reaching for eggs. 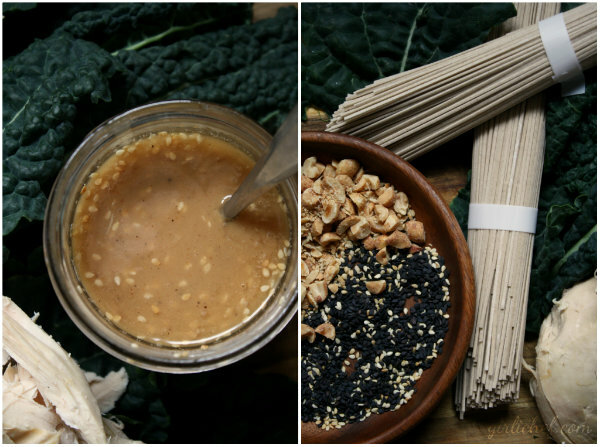 Combine everything in a jar with a tight-fitting lid and shake like crazy to combine. Set aside. Bring a pot of water to a boil. Drop in the noodles and cook for 4 minutes; drain and hold until ready to combine. While your noodle water is coming to a boil and the noodles are cooking, you can get everything else ready. Heat oil in a wok over medium heat and add the kale and chile flakes once it is very hot. 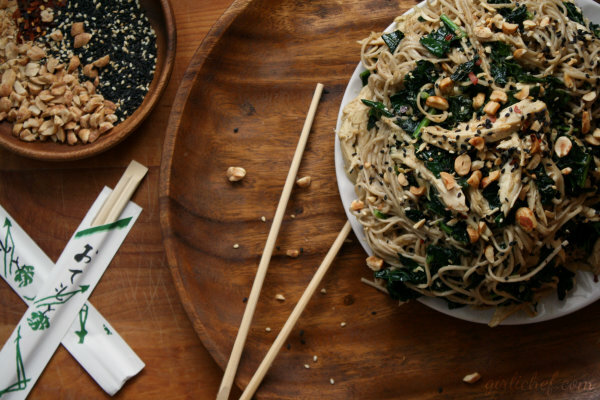 Stir-fry until kale is wilted and bright green, 3-4 minutes. Add the shredded chicken and cook until heated through, 1-2 minutes. At this point, your noodles should be about done - add the drained noodles to the wok and stir/toss to combine. Pour the reserved sauce/dressing over the top and toss until just heated through, about a minute or so. Scatter chopped peanuts, toasted sesame seeds, and crushed chile flakes to taste over each serving and enjoy! This was one of those dishes I came up with when I was trying to decide what to do with an "extra" rotisserie chicken. Initially I made the dressing - my favorite dressing to toss with a cold noodles salad (with chicken, bell peppers, snap peas). It's a dressing I've been making for years, adapted from Ina Garten originally. I decided I was going to try it warm, and happily, it worked well. So yes - try it as a cold dressing, as well as a hot sauce!